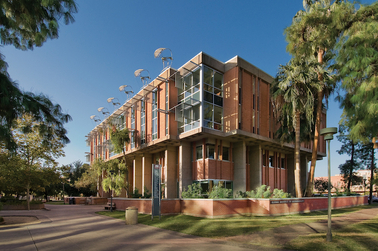 Wrigley Hall is home to ASU’s Global Institute of Sustainability and School of Sustainability and features several elements of sustainable design. The first thing that many people picture when they hear the word “city” is a glittering, glass-and-metal skyline. While cities are many things, they always include a collection of buildings. Houses, office parks, skyscrapers, restaurants – the urban environment is a study in construction lined up and framed against the sky. It makes sense, then, that a key step toward creating a more sustainable city might be to create more sustainable buildings. A number of researchers at Arizona State University have turned their attention to making buildings more sustainable – both environmentally and for human health. They are figuring out how to improve the design of buildings in order to save energy, use materials with less negative impact and get one step closer to that elusive “sustainable” label.